The goal of the race is to garner support for people in recovery and to educate the community at large about behavioral health issues. Heroes in Recovery, a movement celebrating the heroic efforts of those who seek addiction and mental health treatment, and Michael's House are proud to bring its family-friendly 6K Run/Walk event to the Palm Springs community for the fifth straight year. The race will be held on Saturday, February 6th at 8:00 am in front of Michael’s House at 515 N Palm Canyon Drive in Palm Springs. 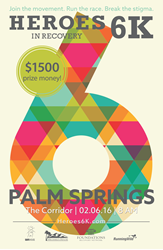 The race takes participants on a scenic 6K (3.728 mile) out and back course through beautiful Palm Springs. The goal of the race is to garner support for people in recovery and to educate the community at large about behavioral health issues. It includes cash prizes totaling $1,500.00 to be presented to the top four males and females in the Overall and Masters age division. The fourth place finishers will be recognized with the unique distinction of ‘Almost Podium’. 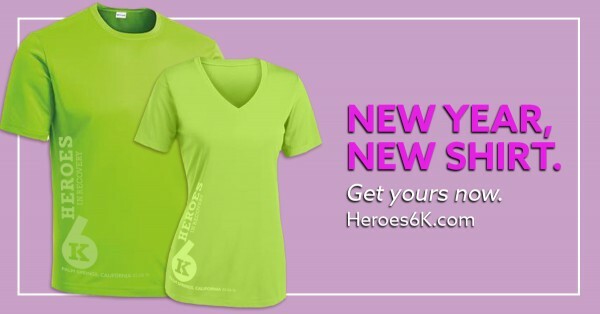 All Registered participants will each receive a commemorative technical t-shirt and a wooden finisher’s medal celebrating the 5th anniversary of the race. This is a family-friendly event and will include post-race nutrition and entertainment for race participants and spectators. This event marks the 28th in a series of 6k races since 2011 being held across the country to raise awareness and break the stigma associated with addiction treatment mental health needs and recovery. Previous events have taken place in Nashville, TN New York, NY, Palm Springs, CA, Louisville, CO, Coconut Creek, FL, Roswell, GA and Memphis, TN. Early registration for all races is $25, regular registration is $30 increasing to $35, and day-of-race fees are $40. Headquartered in Nashville, Tenn., Foundations Recovery Network is one of the premier organizations for treating those with co-occurring addiction and mental health disorders. FRN’s treatment facilities include Michael’s House in Palm Springs, Calif.; The Canyon in Malibu, Calif.; La Paloma in Memphis, Tenn.; and Black Bear Lodge in Sautee, Ga.; as well as full-service outpatient treatment centers in Atlanta, Ga.; Santa Monica, Calif.; Memphis, Tenn.; Nashville, Tenn.; San Francisco, Calif.; and Palm Springs, Calif.
All Foundations Recovery Network treatment centers practice a system of care that treats co-occurring disorders in a fully integrated approach for lasting recovery. For more information, please visit http://www.foundationsrecoverynetwork.com.